Learn how establishing a Defined Contribution Health Benefits plan can fix your healthcare costs and reduce administration time. 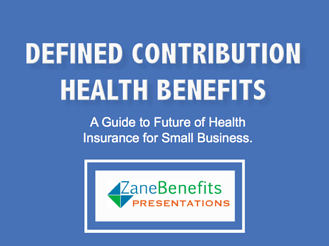 Zane Benefits, which provides businesses with comprehensive and flexible defined contribution health benefits and private exchange solutions, today announced it had published a free guide named “A Guide to the Future of Health Insurance: Defined Contribution Health Benefits” to provide insurance, accounting and small business professionals with a simple introduction to defined contribution solutions. According to the Zane Benefits website, defined contribution health plans are gaining popularity in the U.S. due to the rising costs of traditional employer-sponsored health insurance. With health care reform taking full effect in 2014, the defined contribution model is at a huge advantage and is steadily becoming a mainstream model for employee benefits.